So did you always want your wedding to be a fantastical affair set in a Victorian theme or an Egyptian setting? For most of us Indians, a wedding is a big affair and often for logistical and traditional reasons it is not possible to create a fantasy ambiance on the day of the wedding. However, if you want a bit of drama and live up to the theatrics that you always wished to have in your wedding function a reception may be a more convenient time to experiment. Unlike a wedding, where rituals take precedence, a reception is a more laid-back affair where both the host and guests can let their hair down. If you are in a mood to splurge here are some out of the ordinary venue choices, best suited for a wedding reception. Hire a yacht: Yes, you read it right. Imagine a dinner party with all the dancing and feasting as you sail on the seas and count the stars above your head. If you live near a bay area hiring a yacht for a wedding can be a really groovy way to entertain your guests. And if you are not near the shores but are willing to send the moolah a destination reception at Goa or anywhere near the sea may not be a bad idea. On a high rise: Another interesting idea could be to have a marriage ceremony on the top of a skyscraper. Ask a friend who may have a top floor flat or a penthouse on a higher floor. If you can manage then call for the party on a skyscraper. This way you can have your very own extraordinary setting. In a botanical garden: If you are getting married in the spring it will be a good idea to host a reception lunch at a botanical garden in the city. With so many in blooms in their full glory, you will no additional decor`. At the seashore: If you cannot manage a yacht do not worry. 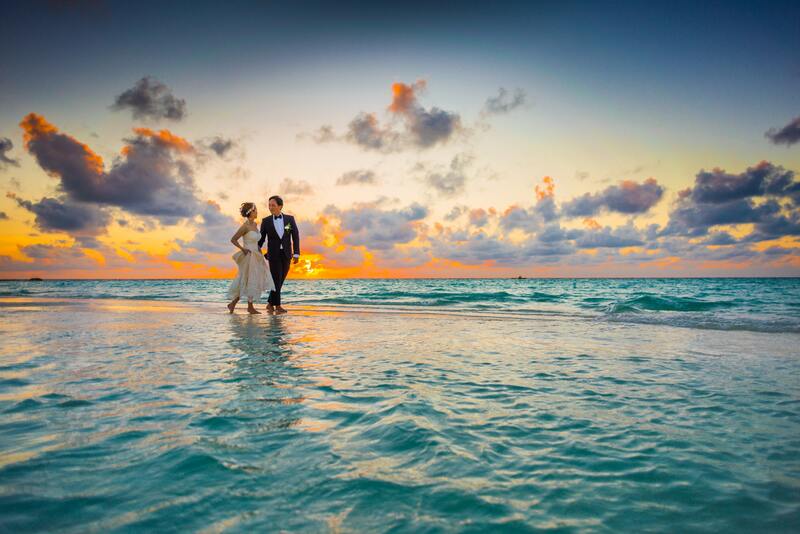 You can still have fun if you decide to host your wedding reception on the seashore. The setting sun, sand on your feet, music in the background… there is no other way to create a more magical ambiance. At a local farm: If you can manage to find a farm near your city shift you party to a country setting. Keep it as close to the nature as possible. You can even call for a petting zoo for children to have some fun at your wedding and for their parents to shake a leg or two as the children marvel at the rabbits, goats, and squirrels. At an observatory or an aquarium: If your city has an observatory call them up and ask if they allow booking small private functions. Another idea can be to call the local aquarium and ask if they can lend the space during their non-working hours for you to call your friends and family over for an adventurous party. June 4, 2018, 1:33 p.m.